1. For the pastry, pulse the flour, butter and a pinch of salt in a food processor until the mixture resembles coarse breadcrumbs. Add the sugar and egg yolks, then pulse till the mixture combines and leaves the sides of the bowl. Bring together into a ball, wrap in clingfilm and chill for at least 1 hour. 2. Coarsely grate the pastry into a 30cm loose-bottomed fluted flan tin. Press on to the sides and base as quickly as possible, leaving no gaps. Chill for 30 minutes. 3. Preheat the oven to 180°C, gas mark 4. Line the pastry case with a sheet of greaseproof paper, fill with baking beans and bake blind for 15 minutes. Remove the paper and beans and bake for a further 10 minutes, until golden. 4. Reduce the oven to 150°C, gas mark 2. For the fi lling, blitz the almonds in a food processor until finely ground. In a large bowl, beat the butter and sugar until pale and light. Beat in the ground almonds, then the eggs, one by one. Spoon into the pastry case, level the top and bake for 1 hour 10 minutes, until puffed up and golden. Cool on a wire rack. 5. 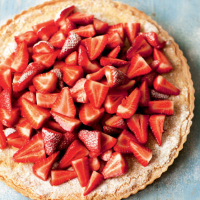 Cut the strawberries into wedges, arrange on top of the tart and dust with icing sugar.